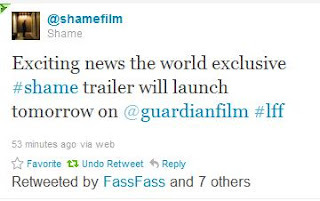 Fassinating Fassbender - A Michael Fassbender Fan Blog: Shame Trailer Coming Soon! For those of you anxious to see the Shame trailer, it will debut Friday! If you're in London and have tickets, you can just go to the BFI London Film Festival to watch it starting today, and it will repeat tomorrow.The screenings are booked solid. I can't wait! Ever since I heard of this project, I've been waiting and wait for a trailer! Now it's finally here! Good thing I follow this blog. *pft lol* I forgot the link. Dumb me.